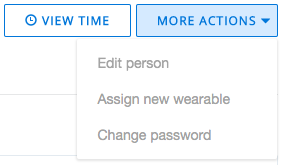 Option 1: Manually create Time Entries if an employee forgets their wearables. Log in to your account and go to the day you wish to enter in your hours. Click on the grey empty boxes of the day you wish to create a time entry for and enter in your Start Time and End Time (identify am and pm), then select your task and write down the description of the task (optional). Click on Save and then click on Submit to submit your time entries. Please note that you can exit out of your time entry without having to submit it right away, however always be sure to Save your time entries. If a new Wearable is available for reassignment, administrators have the ability to reassign them by editing the employee's profile. Click the "People" icon on the left-hand side of the page and chose the employee you want to assign the new wearable to. 2. On the employee's page, click on More Actions on the top right-hand corner of the page. Then click on Assign New Wearable. 3. From the drop-down list select the wearable you wish to assign to the employee. Note: Wearables that are marked Assigned are already assigned to another employee. When reassigning another employee's beacon, it will turn off and no longer be used for the previous employee.